I love iris- all kinds but especially the bearded iris. Iris is the Greek word for Rainbow. 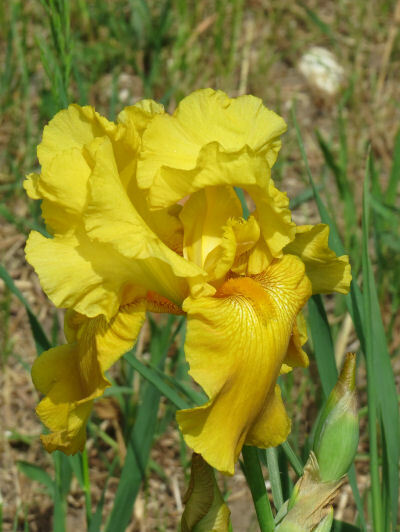 Pretty good description, although no one has yet been able to cultivate a true red iris. These are pictures I took in other people's gardens over the past few days. Just enjoy. 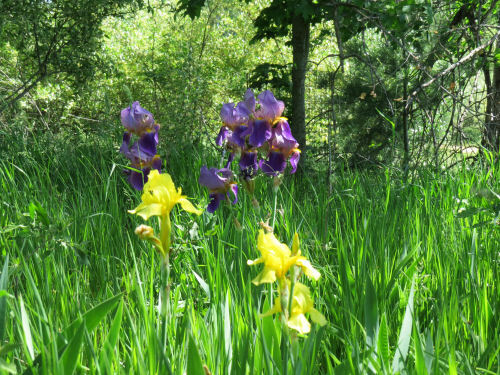 Some kind of iris is found in almost every temperate region on the planet. 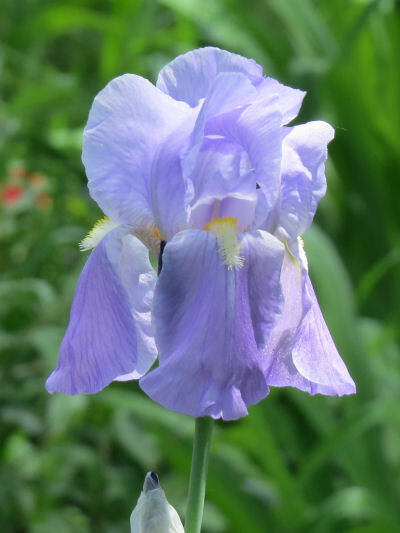 There are over 30,000 cultivars of bearded iris alone, not even counting other types. The link at the end is pictures of the day Loretta and I visited an iris farm a few years ago. I'm pleased and amazed that the mess I keep fooling with actually looks somewhat like a flower garden this year. I'm enjoying it as much as I can before I leave at the end of the week for the BIG HIKE. Here is the ajuga and fleeceflower again, at their best. I also showed you the sandwort with its early leaves. Look what it's doing now! Here's a nice little treat. 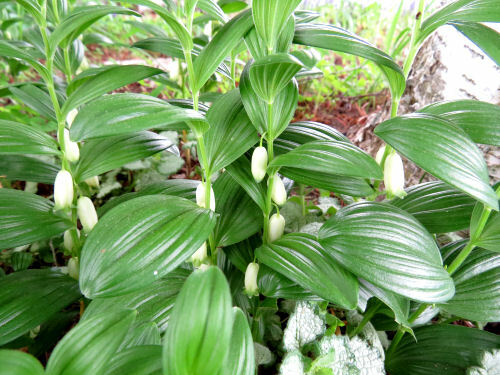 This is a miniature Solomon's Seal, and it was a gift from Ester a few years ago. It seems to be really happy here. I'm always pleased when something agrees to grow without a fight. Across the driveway, I'm struggling to get that bed weeded. I'm fighting for the right to the property with a hill full of biting ants. I'll win, but they aren't going down without a struggle! This is Veronica. I think I actually bought this one. It will bloom a long time if you keep deadheading it. But I'll be leaving, so I'll just enjoy it this week. I have another one, but I'm not sure what color it is. I had a pink one, but not where this is! Did I move it? 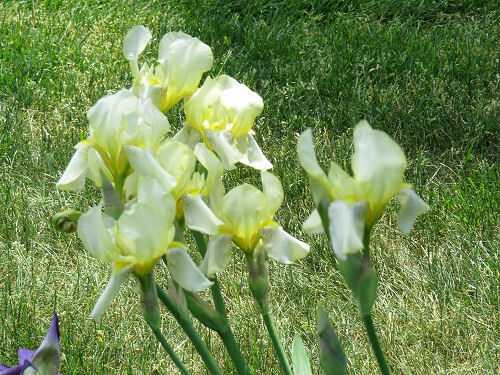 Finally, the iris usually manage to bloom even when neglected and not weeded. I'm glad I get to see them. I guess this week I'm on a kick of enjoying old-fashioned flowers. 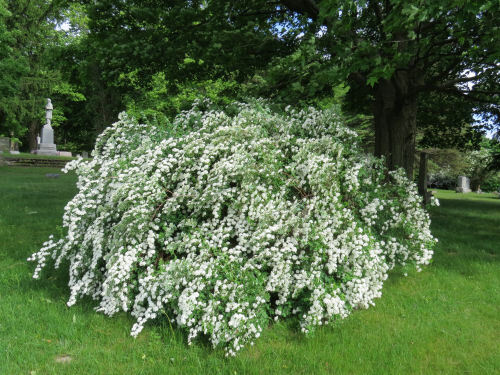 At the house where I grew up there was a hedge of four or five of these bushes- bridal wreath spirea (or spiraea). Because of the drooping aspect of the branches weighted down with blossoms, there was a "secret cave" beneath those bushes where I used to play. 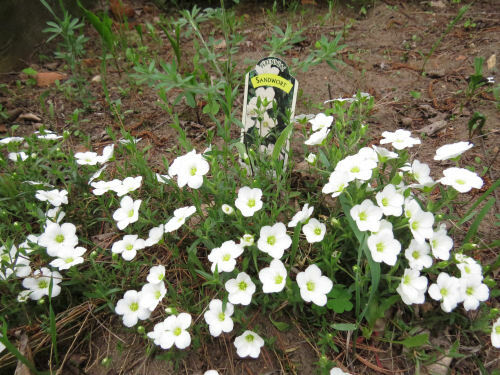 As I mentioned before, these flowers were always part of the Memorial Day bouquets we placed on graves. There were so many of them we could cut many sprays and never miss them. 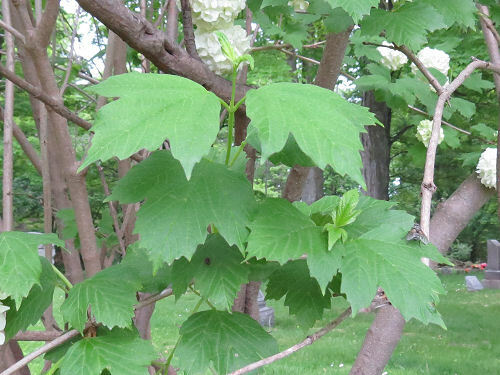 The plant seems so all-American it's hard to accept that the shrub is native to Korea, Japan and China. It can now be found in almost every state east of the Mississippi. Look at the flowers close up. Don't they look a lot like the cherry and pear blossoms? That's because they are cousins, all in the Rosaceae family. Those five petals and long stamens are typical. 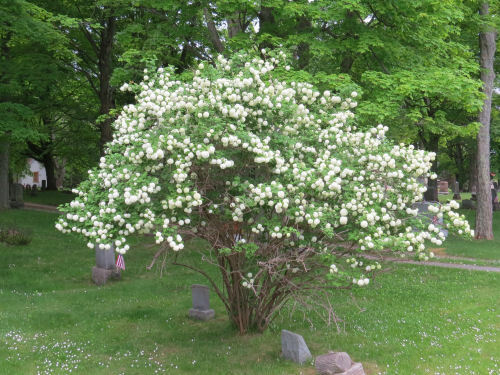 The species name for this is Spiraea prunifolia. Like the snowball bush, I found these in the cemetery. 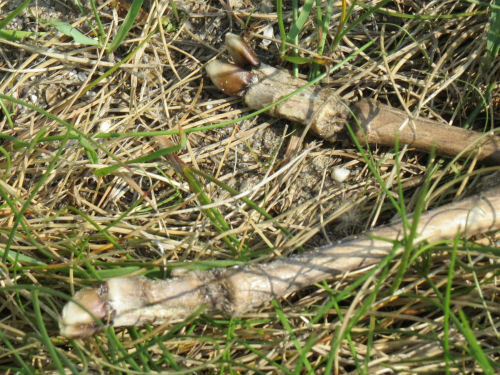 Here is an interesting item often found in the woods this time of year, Later in the summer you can still find them, but they will be brown and dried out. This one is about an inch and a half across- and average size. They aren't often attached to tiny oak leaves, although this one made a nice presentation. 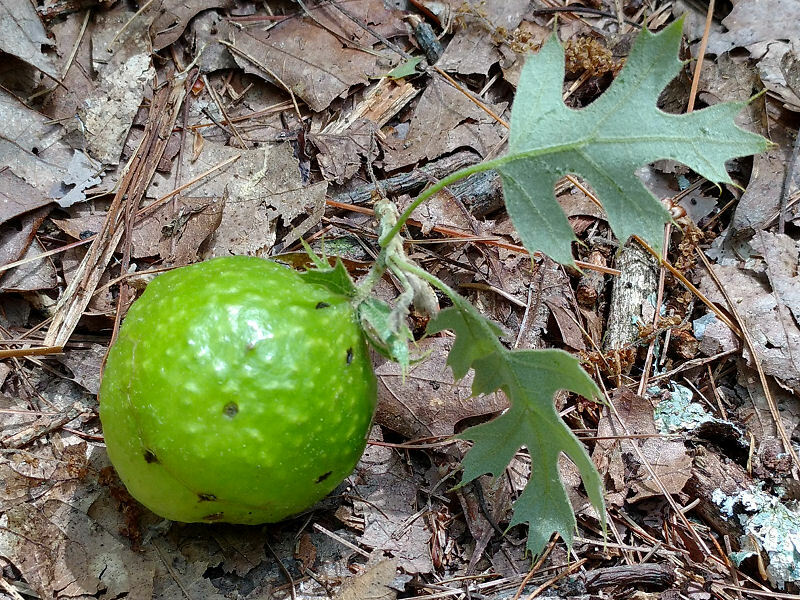 It also highlights the common name, oak apple gall. It sure does look like a little green apple with oak leaves! This is a common gall, and you are likely to find them in the woods most any year. Plant galls are usually caused by the piercing of the outer layers of leaf or stem by an insect. This is usually to lay eggs. More than one kind of insect may be the cause. The gall is the plant's response to chemicals injected at the site. All are in the family Cynipidae, commonly called gall wasps or gallflies. 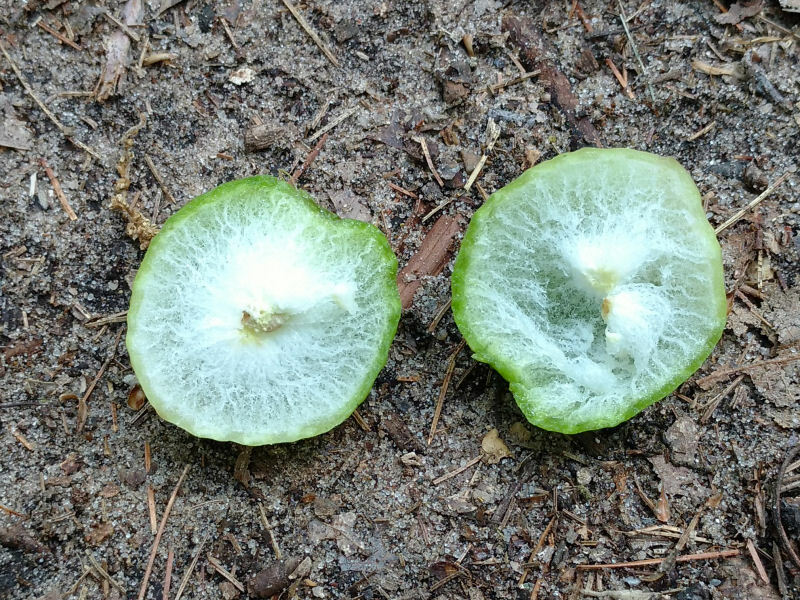 When you cut open a gall, you can tell it's not anything like the inside structures of a normal plant or living animal. There is a kind of organization, but no organs or circulatory system, etc. 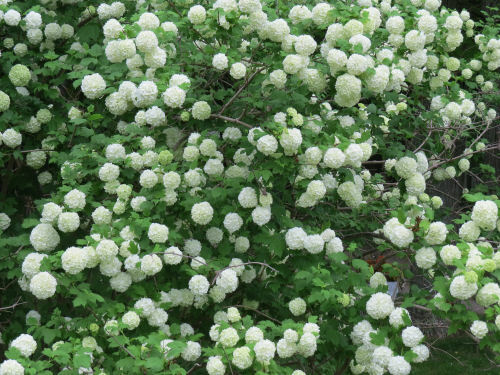 I briefly mentioned snowball viburnum the other day. I don't have one of those now, but we did at the house where I grew up. I like this shrub a lot. This one is in the cemetery. You can see why it's usually just called snowball bush! When I was a child we usually took flowers to the cemetery on Memorial Day to put on my grandparents' graves. 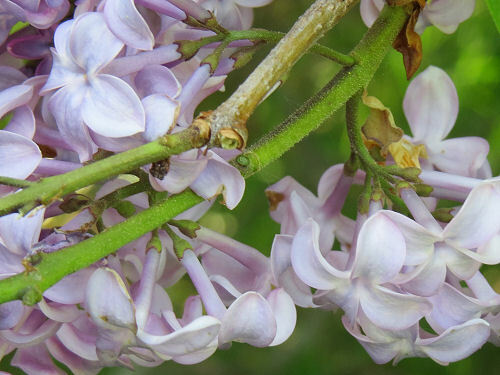 I remember huge bouquets of iris, spirea, snowball bush, lily of the valley, lilacs, and peonies. 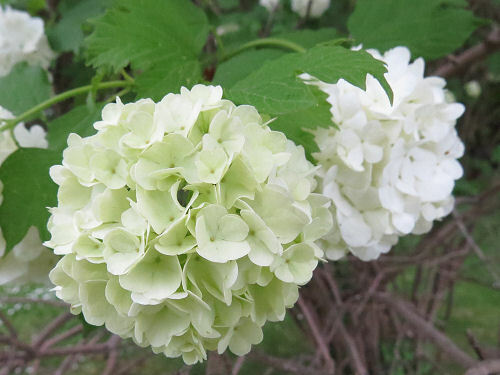 The balls range from light green to pure white, with clusters of five-petaled flowers. 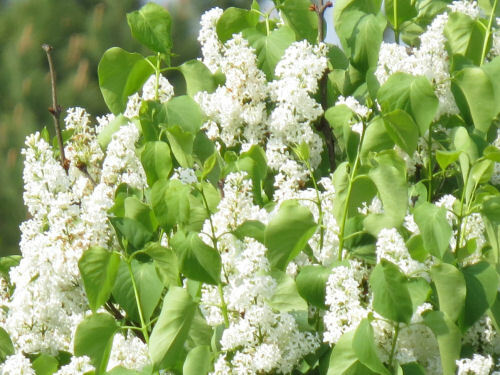 As an ornamental planting it is centuries old, although I couldn't find exactly when it was introduced. It probably was developed in Holland. 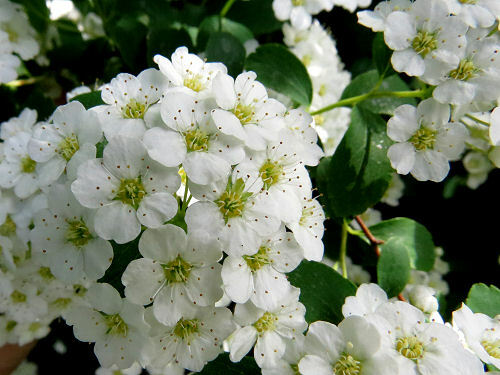 They are actually a cultivar of the same plant called highbush cranberry that I've mentioned several times. And here are the leaves, very typically viburnum. 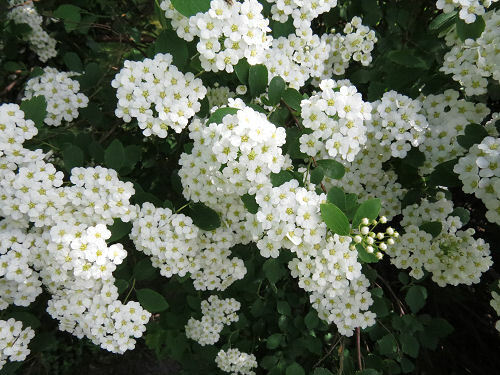 The cultivar is Viburnum opulus 'Roseum', (or 'Sterilis' or 'Snowball'- they are all the same). The deal is that all of these flowers you see are sterile. If you look closely (the picture above is more clear) you can see there are no stamens or pistil in the middle of those blooms. Lots of show, but none of the working parts! 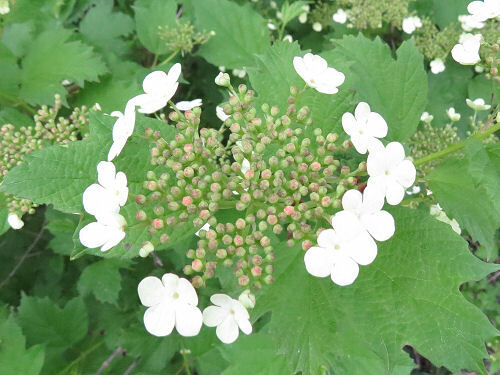 Here is a typical natural viburnum flower head. The outer flowers are sterile to attract pollinators, but those tiny inner ones (not open yet in this picture) do the reproductive work. Some Dutch plant tinkerer figured out how to make the plant grow only sterile blossoms, and when they take up all the space the result is the globular flower head (corymb). Caught this picture on Tuesday, from a long distance away. That's why it looks so hazy. You can just see the wake made by the person being pulled by the kite in front of the breakwall. I hope s/he had on a wet suit. The big lake is pretty darn cold yet! 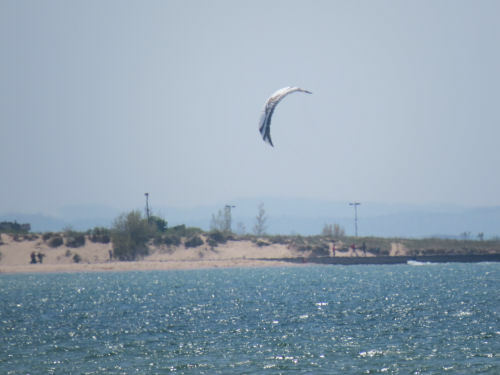 Apparently, the Great Lakes are becoming well known as fun places to kiteboard. 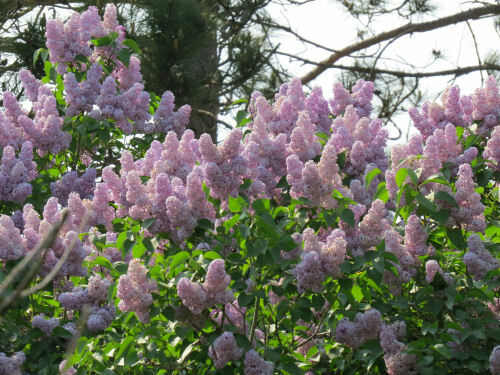 The lilacs this year are impressive! Even my often marginal ones are nice. Mine are just the common light purple ones. Whatever color, they smell divine. Did you ever look closely enough to realize that each blossom is really a long tube with flared petals at the ends? 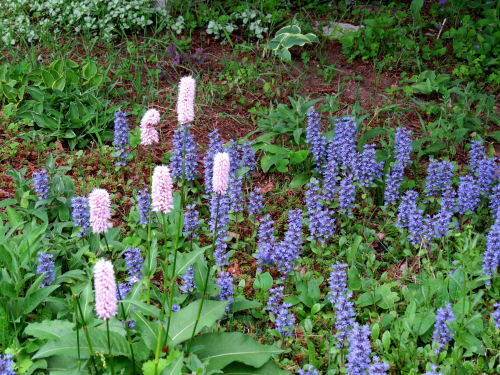 At the house where I grew up we had a hedge beside the creek that alternated bushes of light purple with white. I always thought that was pretty. And until having a lilac hedge of my own I did not realize how much work my dad had to do to keep it in check. The one here is out of control. Or maybe they don't grow as many suckers in clay as they do here. I don't have any white ones but my neighbor does. Although I'm not a particular fan of purple, I do prefer intense colors, so I've always sort of wanted one of these dark purple ones. This was a fun find. 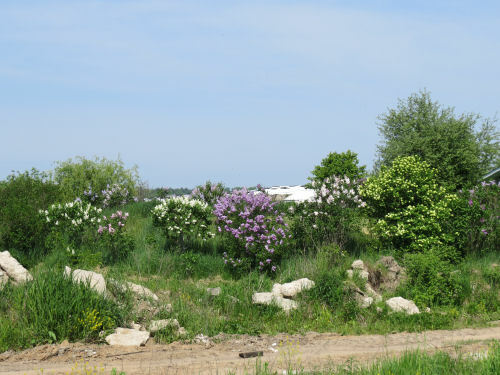 The building this hedge surrounded is gone, but someone sure loved lilacs. There are quite a few different varieties (and a snowball viburnum) in the lineup. I may have to go back and look at this one more closely. It seems to have two tones in each cluster. 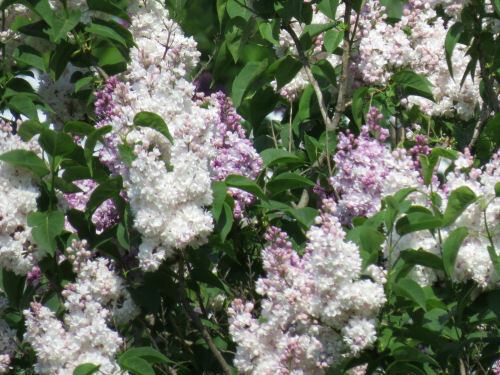 There are lots of specialty lilacs. 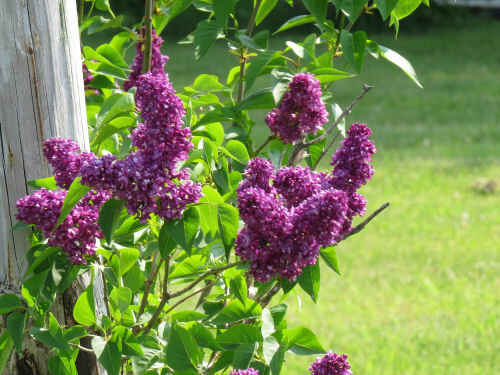 They were particularly popular in France around 1900, and many cultivars were created. Originally, they are native to the Balkans. 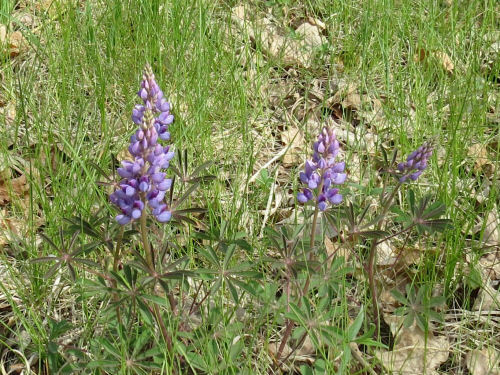 I thought it was a little early, but I saw a few lupine in bloom today. 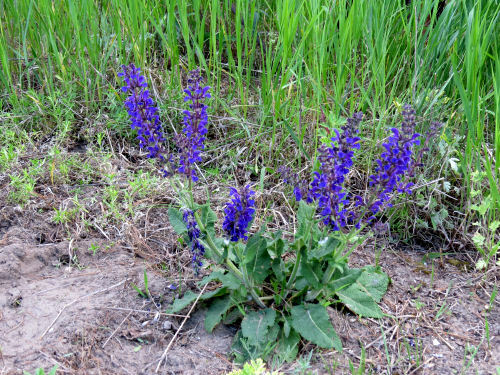 Another week or so and there will be huge patches of them at woods edges and in open areas. Some of you aren't going to like this post. It's certainly not a happy one. But it is truthful, and instructive in its own way. 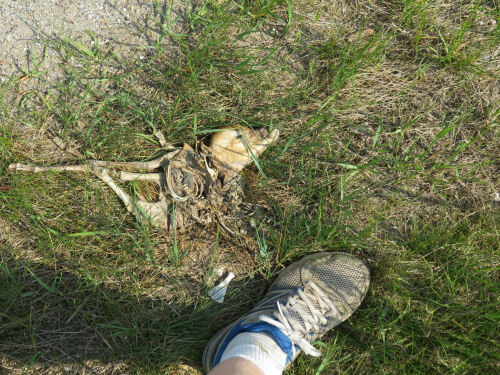 I was walking my road walk loop today and came across a small dead animal. Nothing unusual in that. 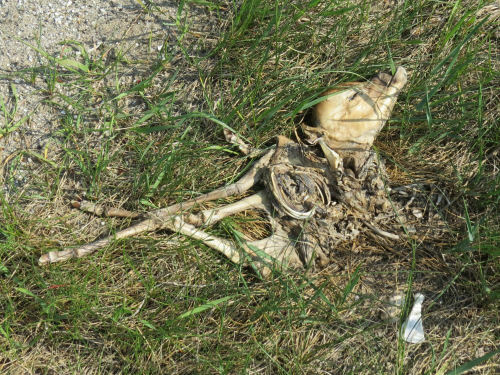 But then I realized it was the remains of a tiny fawn. Too tiny to have been born yet. See it with my foot for scale. In a grown deer that small shoulder blade just beside my foot would be as long as my shoe and almost twice as wide. I think what must have happened is that the mother was hit by a car, and spontaneously aborted the fawn. Look at the tiny hooves. A few more steps, and... it was twins. I found the second one. Just a little farther, and there was an adult deer... too far eaten by predators to tell much, but perhaps the mother. 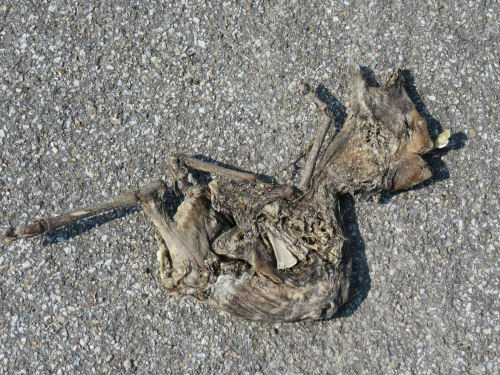 Although much decayed, it's amazing how perfect that one little baby deer is. Most of us that live in the country have seen newborn fawns and realize that they are about twice this size, even for twins. I wonder how many more weeks this unborn fawn would have remained in the protection of the womb. I wonder if they were "born" alive and died beside the road. That seems particularly sad to me. Part of me hopes they were dead of the impact shock before they hit the pavement. Life has its cruel moments, but some seem more cruel than others. 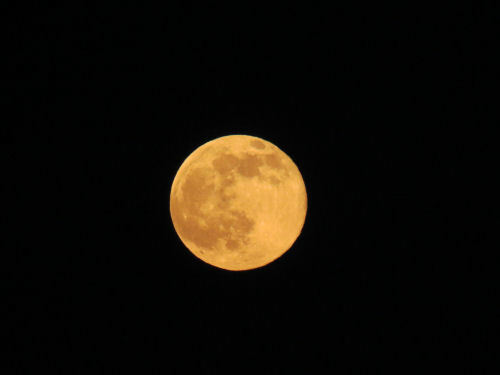 Full moon last night. Wonderful! More sun and loveliness today. Wonderful! 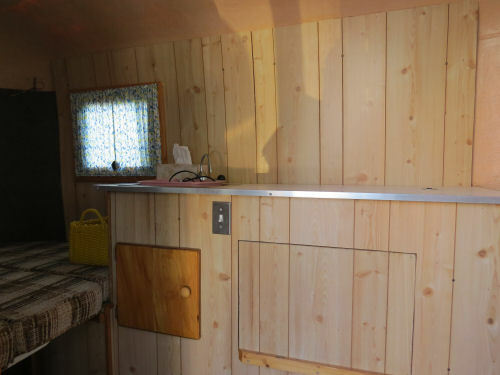 The big decision of the week is: should Marie and I take the trailer on our basecamping hike, or the tent? Weather forecast for the area is wet. 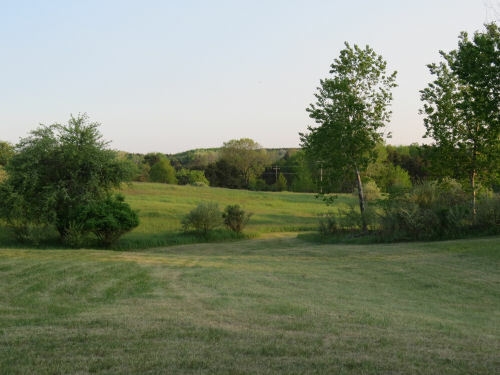 Campsites are close together. Maybe trailer. 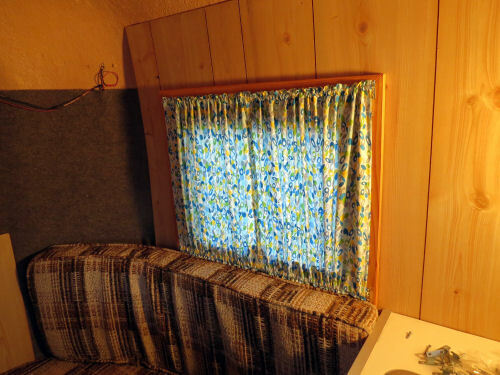 Did I ever show you the curtains I made last year? I actually have one more to make to finish them. Today, I removed a stove burner unit that I'll never use- way too big for my needs. Now I have useful counter space. Also vacuumed everything to remove all the dead bugs and clean up the cushions. And I removed the exterior battery which supposedly could supply interior power, but I suspect it's dead and I won't use it anyway. The other big choice in the works, but we will wait a couple of days to decide, is if we should postpone the whole adventure by week. Marie has been sick. Oh, in other not so quality news, the lawnmower transmission decided to give up the ghost. That repair is beyond me. Will call service guy tomorrow. I know I missed a couple of days here on the blog. Nothing awful except work was long and difficult and I was just too tired.